Yes, it's Thermy! My first thought (I didn't have reading glasses on to see the fine print) was that this must be some bizarre scheme cooked up by the local meat distributor. When dad undercooks the pork loin and the family gets tapeworm, the meat distributor can say, "don't sue us! You didn't follow Thermy's instructions!" I imagine Thermy chirping out his catchprahse in a high-pitched clown voice. Too creepy. 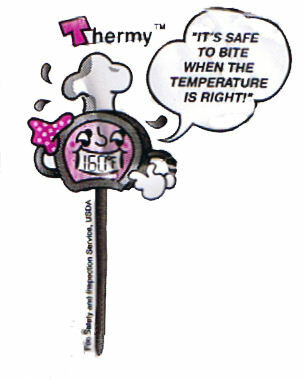 Nope, it turns out that Thermy is a part of a food safety campaign by the USDA. Our tax dollars at work. Check out the entire set of Thermy graphics. Watch out for that killer George Foreman grill, Thermy!